This 2 day training was the best detail experience I have ever had. The Detail King staff are amazing at training and making sure you are doing the job correctly. I would recommend Detail King to anyone looking to get into car detailing. The equipment I used was great and the staff made sure I understood all of the supplies, equipment, and polishes. Detail King by far has the best detailing waxes, sealants, polishes, etc. The company’s products are biodegradable so it really helps put the ECO in detailing. When taking the business class the first day, I was really surprised on how much I did not know about the business aspect of detailing. When in the classroom, Nick Vacco and Paul Angell took their time explaining the best methods and procedures for starting and running a profitable auto detail business. My group focused on detailing the Kia Sorento, which in the end turned out to be a whole different car than we started with. The products used really work, and they leave a long lasting effect. I plan on buying the Weekend Warrior business startup package to start my Detail business. Overall, it was a great experience. I attended the October seminar and got certified by Detail King! 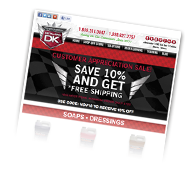 Detail King LP (Detail King) strives to ensure that our customers receive only the highest quality service and merchandise. However, we realize that you may wish to return an item. Please carefully read this Return Policy to see if your item meets the criteria for an acceptable return. 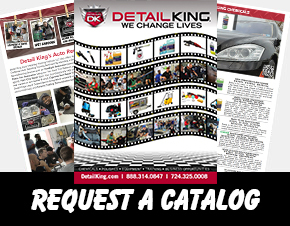 DETAIL KING LP RETURN POLICY: Please inspect your order immediately upon receipt. Detail King will accept the return of many items within 30 days of the date of the original invoice. All returns are subject to a 10 percent restocking fee. Return Material Authorization (RMA) numbers are required for a return and will be issued by a Detail King Customer Service Representative for all approved returns. Products returned without an RMA number will NOT be accepted. Cancellations: If you order products or services and cancel your order before the item is shipped or the service is completed you may be subject to a 5 percent cancellation fee. Creative services such as business card design, logo development and web site design are subject to a 5 percent cancellation fee and any labor time incurred if creative work has already began. Damaged Merchandise: Detail King is not responsible for merchandise damaged by customer misuse or failure to follow instructions specified with the product. Returns will not be accepted for merchandise that has been damaged by customer misuse or negligence. Lost or Damaged Packages: Please inspect your order immediately upon receipt. DO NOT sign for a damaged package without full inspection of its contents. All items damaged in shipment are insured. If you receive a damaged item, please contact Detail King within 24 hours. Returns will NOT be accepted for these items: Detail trailers, pressure washers, ozone machines, extractors, water containment mats and systems, water tanks, paint chip and vinyl repair systems, business packages, training manuals, software, and any custom or special merchandise orders. Please contact Detail King Customer Service if you have any questions about the use of the item(s) or services you are purchasing. Call toll-free Monday – Friday, 888-314-0847 or 724-325-0008, 9 a.m.-6 p.m. Eastern Time.